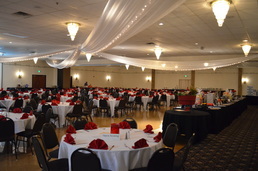 Hearts & Hands of Indiana presented the 9th Annual Houses to Homes Event from 6 - 10 pm on August 4, 2018 at Primo Banquet and Conference Center. The proceeds of this leading fundraiser directly fund the rehabilitation of previously abandoned homes in the near-west side of Indianapolis. These completed homes revitalize our neighborhood by providing families with a stable, quality home to call their own. We are so thrilled with the outcome of the event. The audience included over 500 supporters of Hearts & Hands of Indiana’s mission. This diverse group of greater Indianapolis residents is made up of current and retired business professionals and community leaders, as well as representatives from our partnering community outreach organizations. The Hearts & Hands Event Committee is grateful for all contributions to our Silent Auction and Grab bags! Please reach out to Jocelyn at jjester@heartsandhandsindy.org if you or your business is interested in donating items (gift cards, baskets, tickets to events, etc.) to the Houses to Homes Event. Special Thanks to Our In-Kind Sponsors! To see photos and sponsors from our previous Houses to Homes Events, click on the pictures below.